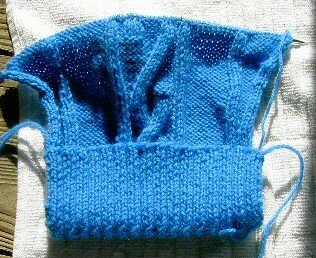 I then cast on for the small wrist, knit the damn ribbing again. 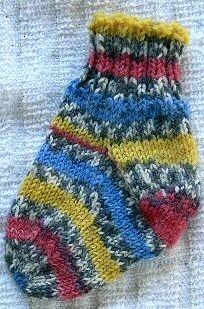 I have done two repeats of the pattern, but I am increasing for the size large. 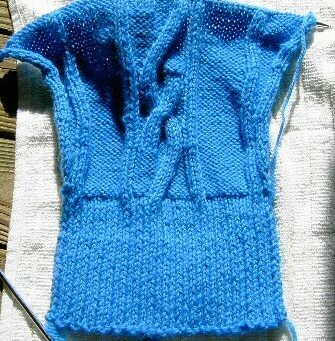 Unlike Bets and the rest of you sweater knitters I have never knit a sweater that has to fit someone in particular. Since the sleeves are set in, I know from sewing that the sleeve cap has got to match the body arm. Not wise to fudge in that area. I love the Highland Wool (no itchy stuff) and I love the color. Not much to look at yet. That is with the cuff turned up. I think if I were doing it again, I would skip the turned up cuff. But I ain't doing that cuff again. 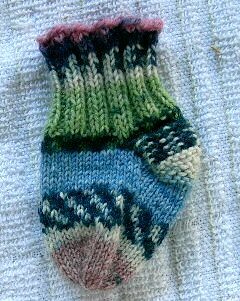 Three more pairs of socks for the baby push. All are done with 2.25mm needle over 40 stitches. 2x2 rib for 2 or 3 inches. One pair only has ribbing for an inch. Cause we all know how much I love ribbing. And I am lazy. From left to right, Elann sock yarn, The Opal Bets swapped with me. This is what was left after doing a pair of socks for me. This pair doesn't match. I was afraid I would run out of yarn. Last pair is some Opal Petticoat in pink. 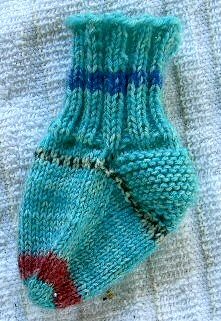 Both the Opal socks have garter stitch heels (which I do not recommend for adult socks) I thought this might make the socks easier to put on the babies and allow for a bit of wiggle room size wise. The colors are brighter, but it is really cloudy outside.